Aquatic Allure : Julep Mystery Box: Hooray For May! 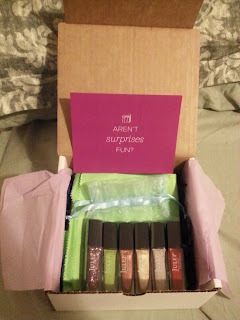 I was so excited about the Julep Maven program that before I even received my first starter box, I ordered their Hooray For May! Mystery Box. Every month Julep offers a mystery box for $24.99 which contents anywhere form $70 to $200 worth of goods. 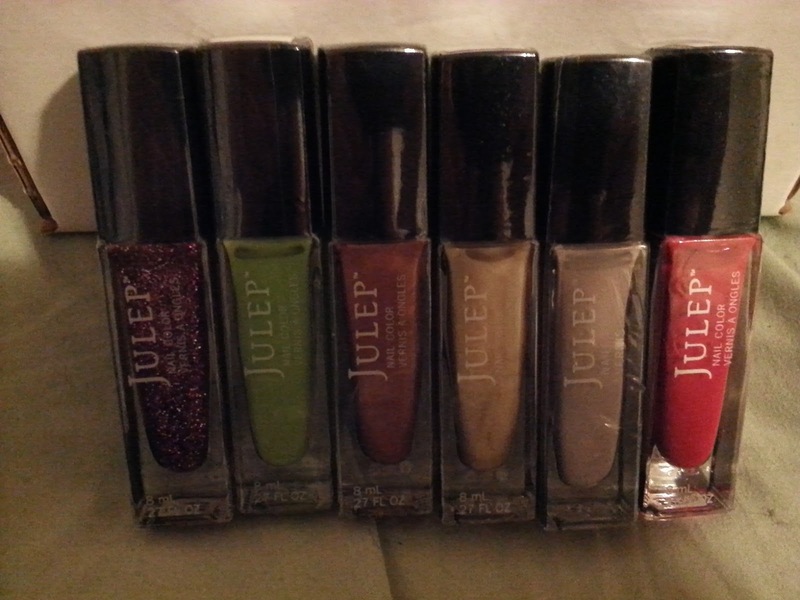 This month's box was said to include one bright and a bonus nail color in a little gift bag. Based on the hint in the email the bright shade would either be a yellow or a green. Overall, I am content with the contents of my mystery box. I was hoping to get the green bright since I love green nail polish and don't wear yellow much. I got Chelsea, Korin, Dakota, Amelia, Annette, and Jackie. Jackie was the bonus polish which came in a cute bag perfect for giving!! As if the mystery box wasn't enough, I also purchased the Sea Salt Collection after reading this blog post about Madeline. The set included Sadie, Jill, and Madeline. 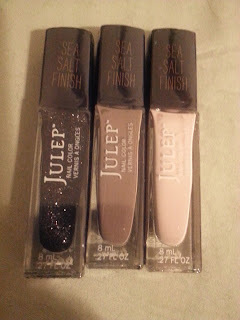 I am super excited to try out the sea salt polishes-I'm loving the textured polish trend!! I'll make a follow up post with pictures when I try out my new polishes!! they all look amazing, but we love sadie the most:) Can't wait to see what they look like on!! Thanks for the comment! Out of the three seat salt polishes, my boyfriend thought Sadie would be a nice one-guess he was on to something!! I can't wait to check them out!